Hi Friends, Please enjoy this great guest post from Tessa Maguire. She's got some great ideas for looking at math in a new way! Math. What do we do about Math? There are tons of great resources from knowledgeable experts like Fountas & Pinnell, Richard Allington, the Two Sisters, and Debbie Miller for reading instruction. They offer tips for structuring your day and tell you how you need to meet with small groups of students to ensure you are reaching your students' needs. They give you ideas on how you can still, just maybe, use your basal. But that's reading. What do we do about Math? Where are those great resource books that tell us how we can structure things to better differentiate for our students in Math? I haven't found anything that I've really loved. And I don't know about you but I've always struggled with those students who breeze through the work in .2 seconds and are done and you haven't even had time to pull the students who need extra support yet. What's a teacher to do? I'd like to share with you two common, but different, ideas my teachers have begun to use after we researched and tried some things out. A couple of my teachers have built in game time during their math block. We have 90 minute blocks and they are able to get through the lesson and guided practice within the first hour. The last 20-30 minutes of time is spent to review, reinforce, and enrich. The teachers, with the help of myself, find games that practice skills they are working on each week. Does this take time? Absolutely! But after a year or so they will have a great resource file and won't spend as much time looking. They can pull out games from previous weeks to build in a spiral review, and this also helps keep them from finding different games for every day of the week. Sometimes the games are just simple gameboards with different cards so rules don't need to be reviewed. For those higher students, they can briefly meet with them one day during the game time to explain a new, higher level skill, and the students can spend time that week playing games reinforcing it. The teachers are able to choose which games they think will most benefit their students. If you're using Everyday Math, it's part of the basis of the series. My teachers find additional games outside of what EM suggests. Have you heard of BUILD? I first learned about it from Adventures in Teaching. It is set up much like Daily 5. I shared it with my kindergarten team and they were ecstatic to try it with their students since they already do Daily 5 and their current math centers weren't as effective as they used to be. Like Daily 5, you need to spend some time getting materials ready for your tubs in the beginning, but you don't have to spend the time each week changing it up. It's also very flexible so you can make it work for your classroom. You want students to go to 3 stations? Sure! You want them to go to 5 so you can meet with 4 or 5 small groups? Sure! I created posters for each of the BUILD buckets similar to the ones above. Mine are set up like Uno cards, though. If you'd like them, click on the picture below to download them for free. There's another BUILD freebie for you on my blog if you'd like to stop over and grab it. I hope I've been able to share a few new ideas with you. Have you found something that works well for you and your students? Do you do something similar to BUILD? I'd love to hear more new ideas! I saw this post and had to comment. I work with the two fabulous ladies that created this for our district. It is fantastic and they are fantastic. We love it! I'm so impressed that they created it. Great ideas, Tessa! I agree, I'd love more resources on organizing our time in Math! Math games are most definitely an important part of the Math block! We definitely like the structure it gives us! Great ideas! Thanks for sharing. Many districts here in Texas do a lot of 'problem-solving'..I would say 75% of our math block is geared towards problem solving. We tend to follow 'Cognitive Guided Instruction', Marilyn Burns, and 'Investigations'. And we do it all in math journals and follow 'math workshop'....lots of them sharing their strategies. Super ideas to think about! Thank you! I have heard a lot of great things about Marilyn Burns and Investigations. I want to look into both of them more. Loving this guest post!! Thank you so much for sharing this concept! Hi there, each bin is categorized by the categories above. For buddy games, they are math games that practice skills that have already been covered. For using manipulatives, they are pattern blocks, dominoes, geoboards, etc. that students can just play around with. Independent reading is books about math. The teachers were able to find some low level math books and so the students read those from that bin. Learning about numbers are number sense activites like hundreds charts. Doing math is usually focused on addition and subtraction and is worksheets and/or games. I hope this helps! Feel free to email me at talesfromoutsidetheclassroom@gmail.com if you have any other questions! Love the BUILD idea! 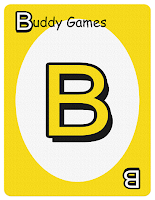 Anyway I can get your BUILD (uno) cards with each letter a different color? Or is there a reason you have them colored the way you do?? Can you share some ideas on what you add to the tubs - especially using Manipulatives and Learning about Math? Cheers! The manipulatives tub has things like pattern blocks, geoboards, dominoes, etc. We purchased Everyday Math and they have a lot of manipulatives. For Learning about Math, it's kinda up to you, but I've seen it successful with practice of the current skill since the other tubs are more spiral review. I hope this helps! Tax Day Sale & Meet Up News! Giveaway Monday Sponsored by Thirty-One!